After watching so many movies based on true events, especially the one that changed the course of history, BATTLE OF THE SEXES stands out as one of the best I’ve seen in so many years. 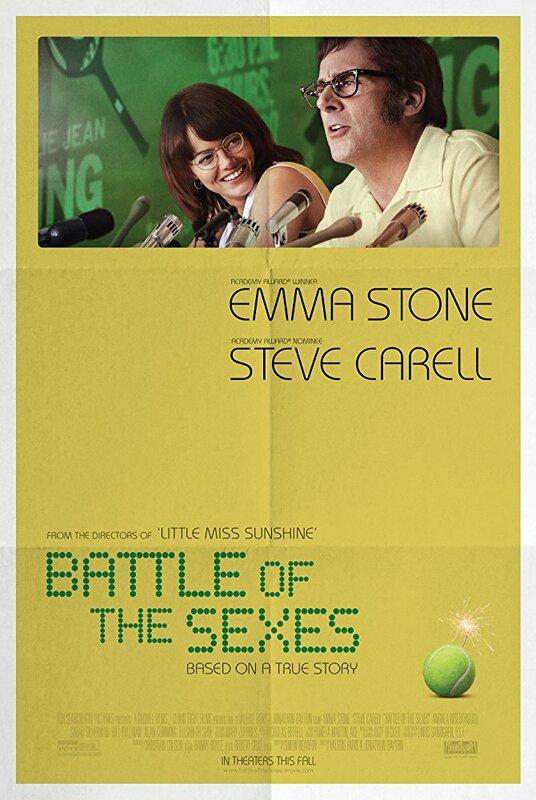 It delivers intense drama, wide shots, super cinematography, manages to recreate the historic tennis game of 1973 between the then world number one Billie Jean King and ex-champ and serial hustler Bobby Riggs. Over the course of the film, Jonathan Dayton and Valerie Faris’ film never had a down time. Its dynamic pace, excellent performances and the whole environment made the preview of the film seem like a festive which does not happen so often. Emma Stone’s facial expression said it all when Margaret Court loses her first exhibition game named as Battle of Sexes against Riggs. King’s anger had no boundaries, and determination was strong enough to start preparing for the lifechanging match while Riggs was hanging out in the pool, still believing women should have never been involved in tennis in the first place. But what’s more fascinating is how Billy Jean King became a pioneer in her fight for equal pay, women’s right and recognition in the world of tennis, where women were never accepted. However, her struggle continues in her private life as well when she starts seeing her hairdresser Marilyn, who at some point will distract King from her final match against Margaret Court. But the most amazing part of the film, of course, was the final match between King and Riggs, that will keep you on the edge of your seat whether you know the outcome of the game or not. And thanks to the incredible cast of the film who simply lived the moment in a way you would not separate the film from reality. Emma Stone and Steve Carell were so great that one would suggest they probably passed a chemistry test not only on the set, but in the lab as well. It was majestic, beautiful and incredible experience to have them both sharing the same sceen. In conclusion, Battle of the Sexes is one of the most important sports drama ever made. It’s about the first fight of women to earn their place in the tennis world. It’s a time when Billy Jean King helps the female players to advance to the next level by accepting Riggs’ challenge. It’s a time when women’s presence was not welcomed, but it is also about that particular moment when a wrong perception of women changed in such a radical way. Yes, many will say Riggs did wrong and should have an open mind. But now, after so many years, rethinking that historic moment you will realize – everything happens for a reason. And if not for Riggs’ ridiculous hatred towards women, we would never have gotten a Battle of the Sexes and women – their respect and acceptance in the world, where man thinks belongs to them only.